The article argues that an understanding of the translation process is an important part of a translator trainer’s competence. It presents the results of an experiment on a bilingual child that measured the development of his natural translation capacity at an early age, the degree of interrelation between his two lexicons, the translation strategies he adopted and their dependence on directionality; and it discusses the implications of these results for translator training methods. ©inTRAlinea & Leonid Chernovaty (2014). "Understanding the Translation Process: An important part of a Translator Trainers’ Professional Competence"
Training future translators/interpreters, like any other teaching task, involves a certain psychological process which the translator trainer tries to control. To ensure the quality of this process, the translator trainer should have a general idea of its essence. Thus the translator trainer’s professional competence has to include, among other competencies, an understanding of the principal features of the translation/interpreting process. To this end it seems reasonable that any university-level translator training methodology should include an understanding of the psychological and psycholinguistic features of the translation process, based on relevant data from psychological and psycholinguistic research into the translation process. To this end, data concerning the development of the natural capacity for translation in early bilingualism, as well as the strategies chosen by young bilinguals in decision-making during translation would seem to be particularly relevant. Such data (compared with similar information relating to future translators/interpreters) can be taken into account in the development of teaching procedures aimed at acquiring these strategies. The processes underlying translation/interpreting activity seem to have been underresearched. As Treffers-Daller (1998) remarks, the psycholinguistic aspects of language code-switching have received much less attention than their syntactic counterparts. As a result, even relatively contemporary analyses are often based on experiments that were conducted quite a long time ago. For example, one such study (Harris and Sherwood 1978) used data that was collected decades before (Leopold 1939; Ronjat 1913). The picture has not really changed in the last fifteen years with the exception of the work of Wolfgang Lörscher (cf. Lörscher 1992; 2005) which mostly deals with adults. The aim of the research project presented in this paper was to establish: 1) the existence of a natural ability in translation in bilingual children; 2) the degree of independence of the two language systems in an early bilingual’s brain during the process of translation; 3) the translation strategies used at an early age; 4) dependence of these strategies on the directionality of the translation; 5) the possibility of successfully developing an increasing capacity for translation at an early age; 6) the factors that stimulate the development of this natural translation capacity and which go beyond those necessary for the acquisition of languages themselves. the subject’s father, grandfather and grandmother, who do not speak English and communicate with the subject in Russian. The materials used during the experiment were stories or fairy tales that corresponded to the subject’s stage of development and included Little Red Riding Hood, Bunny Hooper Who Did Not Like Cleaning Up and A Big Helper (in English), as well as Three Little Piglets and An Animated Hat (in Russian). The subject, within a game-with-adults format, interpreted the fairy-tales and stories from English into Russian and vice versa in 11 sessions (maximum one session a day) of 5-32 minutes each, which were divided into three series. In the first series of five sessions the subject’s father, grandfather or grandmother read the source text out loud to mother in Russian in short fragments after which the reader paused and the subject interpreted them into English. In the second series of four sessions the subject’s mother read the source text in English to father, grandfather or grandmother and the subject interpreted into Russian. In both series the subject had already heard the source texts at least once, while in the third series (of two sessions) the source text in Russian was completely new to him. The duration of each session varied according to the subject’s physical and psychological condition. In the first series it ranged from 6 minutes 6 seconds in session four to 9 minutes 33 seconds in session five; in the second series from 5 minutes 8 seconds in session nine to 31 minutes 48 seconds in session six, and in the third series it ranged from 6 minutes 36 seconds in session ten to 9 minutes 8 seconds in session 11. The average duration of the sessions in the second series (15 minutes 30 seconds) was almost twice as long as those of the first (7 minutes 57 seconds) which can be explained by the gradual development of the subject’s translation capacity. In the third series it fell back to the level comparable to the first series, 7 minutes 50 seconds, which was probably due to the subject’s higher level of stress because he was translating a previously unknown source text. However, in the last series both the subject's translation fluency and his output increased considerably (see below). The subject’s translations were recorded and then transcribed and analyzed. During and after the recording the adults refrained from commenting on the subject’s choice of strategies to avoid any undesirable side effects. If the adult did not understand the subject’s translation, he or she would simply ask the subject to repeat, as happens in a real-life translation situation. To maintain the subject’s motivation, the adults would later replay the recordings admiring the quality of the translation. During such replays the subject often found the words he had failed to recollect during the actual recording. The results of the analysis of the subject’s translations are presented below. М: How do you say it in English? М: Тhat’s in Russian, sweetie pie. How do you say it in English? М: Can you say it in English? М: One morning the Little Red Riding Hood asked her mother if she could go and visit her grandmother. М: Then she saw frogs. S: Then she did* see лягушки (frogs). *in the subject’s interim grammar the morpheme did is used to mark the Past simple forms on the regular basis, such cases are observed in the first language acquisition as well (see Ingram 1992). S (translates): In two... днейз (days)… days he тук-тук (knock-knock)… knock-knock и (and) already made his house. On the other hand, in some cases the use of the wrong lexicon may be explained by the simple absence (in one of the lexicons) of lexical items to mark the corresponding notions. This assumption is corroborated by cases of avoidance, when the subject simply declined to translate:. М: How do you say: наклонился (bent down)? Thus it may be assumed that some of the elements of the early bilingual’s common notional base lack their markers in one of the two lexicons. When the subject needed to render the meaning of such notions within an incomplete lexicon, he resorted to various strategies, among which avoidance was the most frequent. Other strategies included narrowing down the word meaning, generalization and the use of semantically distant words. In other cases the subject applied generalization, that is the use of the whole instead of the part, for instance, meal for breakfast or lunch, or food for cereal. М: After breakfast, Jake, – said Mother. S: После еды, – мама сказала (After the meal, mother said). М: After that the Little Red Riding Hood and her grandmother had lunch. М: Jake ate a bowl of cereal. S: Did see there a big tunnel. S: He did get tired. He wanted to lie to piglets. S: Only the good little piglets did be in the house, did dance and did sing a song. M: Do not worry mommy, I’ll be careful. S: «The other one did be... Not good like the other one. Не ленивый такой (Not so lenivyi (lazy) as the other one). Lenivyi means that he didn’t want build a house. S: Did see his hay house. The lie piglet. S: He did blow another time. Did blow the nother time. In other cases the subject applied words which clearly did not fit the context, which could be the result of a misunderstanding or of fatigue:. М: Jake ate three cheese crackers. М: ‘I want to help’, said Jake. But I just get in the way. М: Those are just little problems. S: He did blow. On the house. F: Счастливый волк и не заметил, как поросенок убежал (The happy wolf did not notice the piglet run away). S: Didn’t see how he run away. The piglet. S: But he didn’t even stop. Did go in his brother’s house. S: Three little piglets did know that they already need to work. S: Because when it’s gonna be winter, you need a house. M: So the Little Red Riding Hood was enjoying the warm summer day. S: They think, Which house do we need to do? S: I want to build my house out of hay. S: He did say: You don’t build a house like that. F: Но самое главное, чтобы он защитил от волка (But the main thing is that it should protect against the wolf). S: The really best thing that he... did protect from the wolf. S: First I’m gonna build the house and then I’m gonna go and play. М: But when the Little Red Riding Hood noticed some pretty flowers in the forest, she forgot what she promised to her mother. S: And like did blow! S: And then if how is gonna yell. S: The hat how did jump!. F: He ran towards the house as fast as he could. F: He grabbed the wolf and he made him spit out the grandmother and the Little Red Riding Hood. F: And after that the Little Red Riding Hood and her grandmother had lunch together and a long chat. М: Then he put on a special cap for sleeping and got into the grandmother’s bed. S: You need to build a house like that ...not wind, not rain, not snow... not snow, not wind… not rain, not snow. S: He did build his house quietly, one stone, then another stone. S: But the other one didn’t like his house. S: Wind can blow and it can go far away. М: He looked through grandmother’s clothes and put something on… so he looks like the grandmother. М: A hunter, who was chopping woods nearby, heard the cry. S: And there stayed his scary brother. F: Их старший брат все видел из окошка своего кирпичного дом (Their elder brother saw everything from the window of his stone house). S: Their older brother did see everything from his stone window. S: And the piglets didn’t be scared. М: The wolf let himself in. М: The wolf came to the grandma’s house faster than the Little Red Riding Hood. М: And he knocked lightly on the door. М: Good girl, you have learned an important lesson. S: He think, Why I can’t blow this house away? S: Nothing. But everything is here. М: The wolf, in the meantime, took a shortcut. М: The wolf felt very happy and satisfied in his belly. S: Волк был очень… ему понравилось. Не хотел больше кушать. Д: The house didn’t fall down. М: Then her mother said to her: Remember, go straight to grandma’s house. М: What are you doing out here, little girl?, – the wolf asked in a very friendly voice. Table 3.5.1. Temporal and quantitative parameters of the subject’s translation by sessions. The quantitative measures of the translation were the source text size (STS) processed by the subject and the target text size (TTS) produced by him. As can be seen from Table 3.5.1, the text sizes definitely increase from session to session, however their objective dynamics is not clear enough as the duration of the sessions varied considerably: from 6 minutes 6 seconds in session four, to 31 minutes 48 seconds in session six. This means that the duration of session six exceeds that of session four by more than five times. The ratio of the STS in these sessions is also 1:5; however, the same ratio for the TTS is only 1:4.25. Thus, if we balance the time parameter in these sessions (by dividing the quantitative parameter in session six into five), the source text sizes processed by the subject in the two sessions would be the same (630 and 629,6 characters respectively) while the TTS produced in session four would be even larger (597 and 507,2 characters respectively). To make the comparison more objective, the figures presented in Table 3.5.1 were converted into more balanced parameters: the STS processed by the subject and the TTS produced by him per minute in each of the sessions. The results of the calculations are shown in Figure 3.5.1. The data presented in Fig. 3.5.1 convincingly shows a favourable effect of the sessions as a catalyst for the development of the subject’s natural translation capacity. While in the first session the STS processed by the subject was just 30 characters per minute and the TTS produced just 31 characters per minute, in the final session those parameters increased almost five times for the STS (149.6 characters) and 4.4 times for the TTS (137 characters). It is worth noting the steady increase of the STS and TTS parameters from session to session which could be regarded as indication of a certain regularity. Another obvious feature is the variation in the correlation between the ST and TT lengths depending on the directionality of translation. In translating from Russian into English (sessions 1-5 and 10-11) this correlation is almost always balanced, that is the STS and TTS parameters are almost equal. 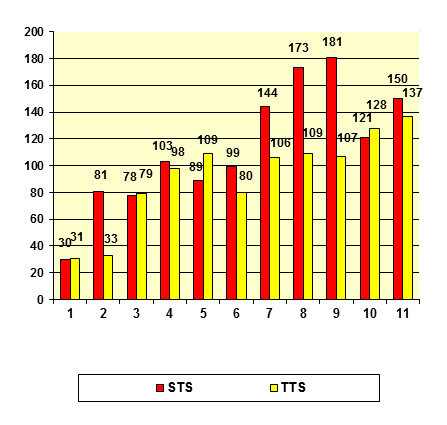 The exception is session 2 where the TTS amounted only to 41 per cent of the STS. However, that could be explained by accidental side effects – a considerable part of STS is taken by the explanation of the straw house characteristics. The father had to paraphrase the source text several times (Он же будет непрочный, некрепкий дом, не сильный. Его же ветром может развалить. Сдуть ветром. Ветер может подуть на него – It would be a flimsy, rather weak house, not strong. It may be ruined by the wind. Blown off by the wind. The wind may blow at it) before the subject offered his translation (Not strong. Wind can blow and it can go far away). As is evident, the TTS in this case is considerably smaller than STS. This relative uniformity may be explained by the fact that while translating from a more frequently used language (Russian) into a less frequently used one (English) the subject gave preference to calquing (to be on the safe side) mostly preserving the ST structure in the TT. This resulted in the approximately similar ST and TT sizes. The simplest explanation may be the subject’s choice of sense-oriented strategy together with the application of compression, deletion of excessive ST elements and transformations (see above for details). It is worth mentioning that the decrease in the application of calquing did not have a negative impact upon retaining the ST sense in the TT – it was at least the same as in translating from Russian into English. The most logical way to explain the dependence of the choice of translation strategy on the directionality seems to be to relate it to the difference in the experience of the two language usages. In spite of regular communication with his mother and other individuals (see above for details), the subject's overall experience in Russian language use is probably wider, and therefore his corresponding lexicon is more developed, and his overall ability to render the meaning of the English ST is greater, allowing a greater degree of freedom in this process. On the other hand, the less structured English lexicon, while meeting the requirements of everyday communication, may not always provide enough freedom in rendering the ST sense, forcing the subject to rely to a greater degree on ST structural schemes. In spite of the obvious limitations this experiment, limitations which are always present in research involving very young children, such as the impact in one-subject experiments of the subject's individual characteristics, and the failure, due to accidental factors, to balance the duration of sessions both in terms of their duration and their directionality, it is possible to suggest a number of hypotheses that require additional research. 1. It seems reasonable to assume the existence of a natural capacity for translation that can be successfully developed even at an early age. This capacity is probably based on certain innate universal principles, given that the subject, despite a lack of any training whatsoever, applied strategies and techniques described in Translation Studies literature. In particular, at an intuitive level, the subject used strategies of both literal and interpretive translation, as well as applying most common translation techniques. 2. In the most general terms, the subject’s translation was typically based on the use of ‘counterpart’ elements he looked for in the two parts of his bilingual mental lexicon. At the beginning of the experiment, if a problem arose, he would use a word from the source language lexicon in the target text, but at later stages he mostly used elements from the target language lexicon, words with the meanings closest to the ones he needed, even though such closeness might be quite arbitrary. There were instances when the subject transcribed or translitered words from the source language lexicon to use them in the target language. This phenomenon was sometimes accompanied by explanation (in the target language) of the neologism he had just created. On other occasions the subject resorted to contextual substitutions, antonymic and descriptive translation. 3. Grammatical and lexical transformations were registered on a regular basis. In particular, splitting complex sentences into clauses and integrating several clauses into a single sentence; narrowing and expanding the meaning of the words; the addition and removal of words, as well as their transposition and the conversion of parts of speech. There is evidence of the subject’s intuitive attempts, even at this early stage of his development, to take into account possible problems the addressee might have in interpreting the target text by providing additional explanations. 4. In translating from the more frequently used language (Russian) into the less used one (English) there seems to be a tendency for the subject to adopt a more literal mode of translation, which is probably related to the unequal development of his lexical and grammatical mechanisms in the two languages. This might force the subject to rely more heavily on the source text structure when translating into English. This assumption seems to be supported by the fact that in translating from the less used English into the more frequently used Russian the impact of the source text structure visibly lessened and the subject resorted to more interpretive mode of translation with a wider use of grammatical and lexical transformations. 5. The results of this experiment appear to indicate that the sessions had a significant educational impact on the subject. They seem to have stimulated the rapid development of the subject’s natural translation capacity. Throughout the experiment the size of the source and target texts translated by the subject steadily increased – to the extent that the amount of text processed in the final session was five times the amount processed in the first. On this basis it seems safe to assume that there is a clear interdependence between the two factors. 6. The experiment confirmed the existence of factors that, on the one hand, stimulate the development of a natural translation capacity, and on the other go beyond those necessary for the acquisition of languages themselves. The data collected in our experiment suggests that these may include the ability to transfer meaning from one language to another, a single notional base that is independent of language, as well as a bilingual mental lexicon. The undeniable pleasure the subject derived from translation also deserves to be included in this list of factors. 7. The are at least two important implications for translator training, in addition to those given above (see Section 1). First, the subject’s application of the majority of known translation techniques would seem to show that the corresponding mental algorithms have been present in his mind since his birth and that, therefore, it might not be necessary to devote much attention to these techniques in translator training as students will use them anyway. Instead a general introduction to these techniques should be enough, without the need for detailed theoretical explanations and commentaries in the classroom, which would provide more time for developing practical translation skills. Second, as existing studies have shown (cf. Lörscher 1992; 2005), bilingual children and professionals both use a sense-oriented strategy when translating, which is the ultimate aim of any translator training. Adult bilinguals and untrained translators, on the other hand, use a predominantly sign-oriented (literal) strategy when translating, irrespective of the languages involved. The subject in this research showed signs of shifting from a predominantly sense-oriented strategy towards a mixed strategy with a tendency to opt increasingly for more literal translation and calquing. The continuation of similar research with more subjects and longer observation periods could provide valuable data for understanding the reasons and dynamics of adults’ transition to sign-oriented translation strategies, as well as for introducing important innovations into translator training methodology, encouraging students to adopt predominantly sense-oriented strategies. Harris, Brian and Sherwood, Bianca (1978) “Translation as an Innate Skill” in Language, Interpretation and Communication, David Gerver and H. Wallace Sinaiko (eds), New York and London, Plenum: 155–70. Ingram, David (1992) First Language Acquisition, Cambridge: Cambridge University Press. Leopold, Werner (1939) Speech Development of a Bilingual Child: A Linguist’s Record, Evanston, Northwestern University Press. Lörscher, Wolfgang (1992) “Process-oriented research into translation and implications for translation teaching”, TTR: Traduction, Terminologie, Redaction 5, no.1: 145–61. Lörscher, Wolfgang (2005) “The Translation Process: Methods and Problems of its Investigation”, Meta 50, no.2: 597–608. Ronjat, Jules (1913) Le development du language observe chez un enfant bilingue, Paris: Champion. Treffers-Daller, Jeanine (1998) “The IC model and code-switching” in Bilingualism: Language and Cognition 1, Issue 2: 98–110. I would like to thank the participants of the experiment: the subject’s mother (Kate Luniova), his father (Yuriy Maliar), grandmother (Svitlana Luniova), grandfather (Mykola Luniov) and the subject himself (Senia Luniov) without whose heroic efforts this experiment and the article itself would have been impossible. Leonid Chernovaty (born 24 March 1950), Doctor of Letters, Full Professor, English Translation Department at V.N.Karazin Kharkiv National University, Ukraine. Head of the said department (1983 – 2012). Full Member of Ukrainian Higher School Academy of Science. President of the Ukrainian Translator Training Union (UTTU). Over 200 publications including the textbook ‘Methodology of Training Future Translators/Interpreters’ (Metodyka vykladannia perekladu) (2013).